or to perform any alterations to existing artwork. We like 3mm bleed if an element of an artwork touches the edge of the page. Our artroom likes print ready files in PDF format. All artwork is to be 300dpi CMYK with any transparency and fonts flattened. (Compatible with Acrobat 3) to avoid any colour shift in the output. Any native jobs should be compressed before you send them via email. For files larger than 10Mb we suggest using Dropbox – Easy to use, free and you can send files up to 100MB. Post or Courier – We can except CD, DVD or USB. 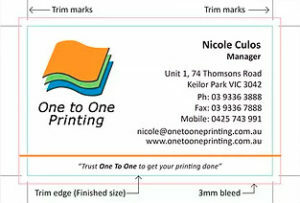 Don’t hesitate to contact us at info@onetooneprinting.com.au if you have any further questions or require information about how to get your files ready to print at the best quality in the least amount of time.